Find yourself surrounded by an amazing 360° view as you stand atop the highest peak of the Appalachian Mountains. Mount Mitchell&apos;s summit (elevation 6,684 feet), located in the Black Mountain range of the Blue Ridge Mountains in Western North Carolina, is the highest point east of the Mississippi River. The peak is located off of the Blue Ridge Parkway in Mount Mitchell State Park, just 35 miles northeast of downtown Asheville. You can drive nearly all the way to the summit, making it easy to explore this natural wonder. And, it&apos;s free for all to enjoy. At the summit, there&apos;s an observation deck. On a clear day, you can enjoy spectacular views and see as far as 85 miles! Also at the summit, you&apos;ll find a museum, shop and restrooms. The State Park also features a restaurant (open spring to fall). For the adventurers, Mount Mitchell offers access to favorite hiking trails that wind through fragrant balsam forests. Along the way, you may see wildlife (91 species of birds have been spotted in the Park) and many rare plants. 1. Summit Trail Hike from Parking Area: From the summit parking area, take the easy-to-follow paved, handicap accessible path just a quarter mile (about a 10-minute walk) to the observation deck. While the trail is short, it is steep. But the amazing 360-degree views at the top are well worth the effort. 2. Balsam Nature Trail: Discover the balsam aroma of the Fraser firs on this short, 0.75-mile (less than one mile) trail from the lower summit parking area. A tiny stream located along the trail is the highest spring in eastern America. This trail is considered moderate. 3. Old Mitchell Trail: Instead of driving to the summit, park at the State Park office and hike your way to the top! This strenuous trail travels 2.2 miles each way and was the primary trail for reaching Mount Mitchell during the late 1800s and early 1900s. Hikers should allow about three hours. 4. Deep Gap Trail: Hike from the highest peak east of the Mississippi River (Mount Mitchell, 6,684 feet) to the second highest one (Mount Craig, 6,647 feet). On the ridge line of these giants of the Black Mountain range, you might find yourself above the clouds! 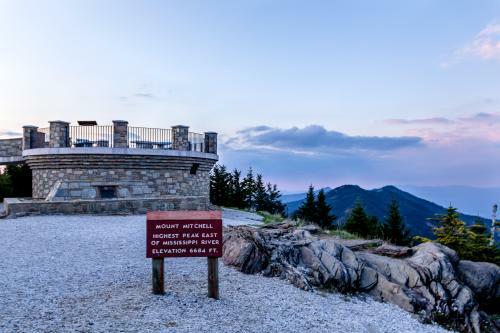 It is 2.1 miles round trip from the lower summit parking area at Mount Mitchell to Mount Craig. The hike is considered moderate to strenuous. COST: It is free to visit Mount Mitchell State Park — there is no admission fee. HOURS: The Park is open 7-days a week, year round (closed on Christmas Day). The hours are seasonal. Please check the Mount Mitchell State Park web site for hours. Most Park services, including the museum, shop and restaurant are open May through October. Even when parts of the Blue Ridge Parkway is closed in the winter due to snow and ice, Mount Mitchell State Park is often still accessible. WEATHER: At more than 6,600 feet, Mount Mitchell&apos;s summit is often 15-20 degrees cooler than the temperature in downtown Asheville. Plan accordingly by dressing in layers. The summit area is often covered in clouds, keep an eye on weather forecasts and try to visit when the sky is clear in Asheville. PETS: Mount Mitchell is dog friendly. Dogs must be on a leash at all times. Most visitors choose to access Mount Mitchell State Park by taking the Blue Ridge Parkway north from Asheville. Mount Mitchell State Park is located approximately 35 miles northeast of Asheville at Milepost 355.4. The entrance to Mount Mitchell State Park is well signed. From the Parkway, it is a 4.5-mile drive to the summit. Should the Parkway between Asheville and Mount Mitchell be closed due to snow or ice, the alternate route is to take I-40 east from Asheville. Take Exit 72 in Old Fort to U.S. 70. Drive approximately 10 miles to NC Highway 80. Then take NC Highway 80 eight miles to the Blue Ridge Parkway. Drive south on the Blue Ridge Parkway (toward Asheville) to the Park entrance. Mount Mitchell is part of the Black Mountains, a range formed more than a billion years ago. Scientists say the once lofty and rugged peaks were worn down by erosion to the rounded shapes you&apos;ll see today. In 1835, Dr. Elisha Mitchell, a science professor, headed to the Black Mountains to measure their elevations. Using barometric pressure readings and mathematical formulas, he estimate the height of Mount Mitchell. Even without modern technology, he was just 12 feet off. In 1858, the highest peak in the Black Mountains was named after Dr. Mitchell to commemorate his findings. In 1915, Mount Mitchell was established as North Carolina&apos;s first state park. Dive deeper into the history of Mount Mitchell State Park and learn more about Dr. Elisha Mitchell by checking out our interactive guide: Explorers of the Blue Ridge Parkway.